There wasn't anything wrong with the outgoing Suzuki V-Strom 1000, but for 2017 Suzuki have made a few tweaks and introduced the more adventure-focused XT version, which gets wire wheels, bashplate, handguards and tapered handlebars. The XT remains much the same as the standard outgoing V-Strom. The V-twin engine makes 101bhp, which isn't anything like the 160bhp of some adventure bikes but is more than enough on the road. There's a slight lumpiness at 3000rpm, but anything above that is smooth, effortless drive. 101bhp might not sound like much in 2017, but it's more than enough to have fun with. 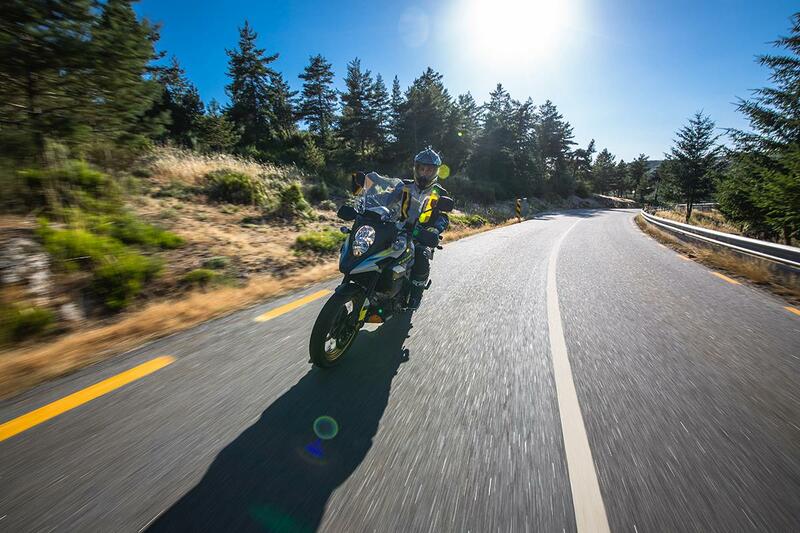 The two stage traction control is the same as on the V-Strom 650XT and does a good job of keeping everything inline without feeling intrusive, even in the highest setting. The 1000XT also comes with cornering ABS - the first Japanese adventure bike to come with the system. During our 160 mile ride through the twisty roads of Tarragona the ABS never activated while cornering, but knowing it's there gives a little extra confidence to trail the front brake deeper into the corner, which doesn't upset the big V-Strom too much. The bigger V-Strom feels much more solid than the 650, which means a little extra pressure is needed on the bars to hustle along twisty mountain roads, but it's by no means slow steering. The suspension is harder, which gives the big 'Strom greater stability while cornering and floods the rider with confidence. One of the biggest gripes about the previous V-Strom 1000 was the buffeting created by the screen. Suzuki have worked hard on reducing this on the new XT and standard V-Strom, completely redesigning the screen. The new screen works much better, with buffeting now at a minimum, eve when wearing a peaked helmet. The screen can be set at three heights and the angle can be adjusted on the move by pushing the screen away from you.